Alright…..so yes, Napoli. 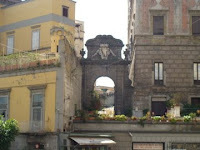 Naples was a lot of very different things; scary at first, robust, passionate, and YUMMY! 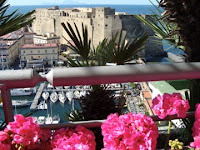 After we survived our third trip on the Circumvesuviana we had arrived in Naples again. But this time it wasn’t just a stop while in transit…we were going to actually stay there for two days. If you had asked me while in the States what part of the trip I was most excited about I would of course talk about the wedding first but I was really really excited to see and experience Naples. We’d heard that while it’s one of the most challenging cities in all of Europe to travel within that it’s also filled with so many rewarding features. Like…..HELLO, the birthplace of pizza (the margherita to be more exact), passionate, beautiful people, tons of history, and the beautiful Bay of Naples. 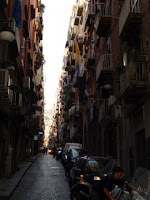 However, once in Italy we were hearing people speak so terribly of Naples, “don’t wear any jewelry,” “my passport was stolen there,” “there is trash EVERYWHERE!” I started to become a little weary…as did Alex! But c’mon don’t you have to have your wits about you in most larger cities in Italy? Aren’t there pickpocketers all over Europe? 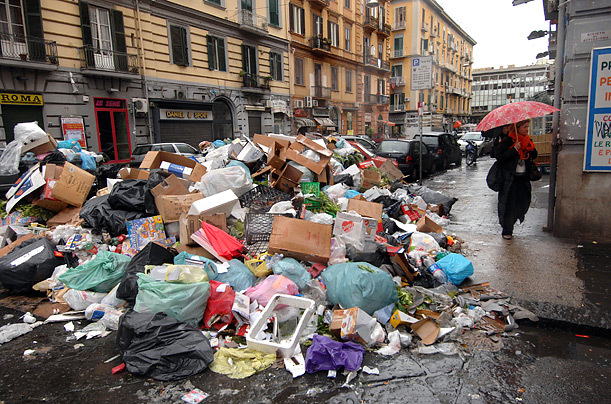 And to be fair…the city center has been clear of trash for probably a few months. However, unfortunately, the outskirts were still piled high with trash in a lot of places (as we saw from the train). We were told by an information desk at the train station that we could use our Circumvesuviana tickets for the tram that would take us to a piazza close to the Hotel Vesuvio which is right on the bay. “Ok, great we thought”….until we got outside and were met with heat, hoards of people, crazy traffic, and dozens of trams (none with our destination displayed on them). So we just grabbed a cab. I noticed that the driver was really driving EXTRA slow…..trying to milk us for all we were worth. Then once we got off he swindled us for an extra 3 euro because he said he helped us with our bags. Um What? He was old and couldn’t lift any of it so Alex did all of that. And I hate when you have no small change, so when you hand them 30 euro because the meter says 26.84 euro you end up getting no change back. UGH. But now we were at the hotel and it was divine on the inside. There were many many pictures of the royalty, celebrities, and politicians that have stayed there over the years! We cleaned ourselves up and headed out to Brandi. A pizzeria about half a mile from the hotel that claims to have the best Margherita in the city, they should though, they were the first pizzeria to ever make it in 1889 for Queen Margherita! We found it not too far after we set out and enjoyed ourselves at an outdoor table…..just watching the Neopolitans walk by. 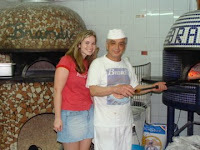 I even had my picture taken with the pizza maker :-) Now we ate more pizza in the South of Italy than we’ve ever eaten before, they were all great…..but this was even better! I can’t even describe why it was THE BEST, it just was! We really enjoyed the meal. 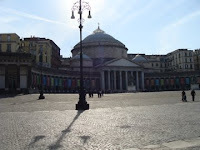 Afterwards we walked back towards the hotel and meandered around Piazza di Plebiscito (my fav piazza in Naples) the church at the one end was just so grand and majestic! We also realized that the pastries here in Naples appeared to be on par if not better than the ones in Positano and Sorrento. 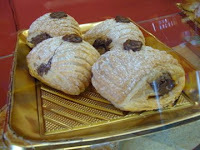 It really was like the city of sfogliatella and nutella. Both amazing things. While in Piazza Plebscito I enjoyed an enormous Bomba con Nutella. I ate the one in the back right :-) And after the lady heated it up in the microwave it was molten paradise! That night we enjoyed Turkish food, the concierge told us about. The place was soo close to the hotel and it was ultra chic on the outside and inside. We had a little trouble with the menu. I do well with Italian menus in Italian restaurants because I know the majority of the dishes. However, when a menu is in Italian describing Turkish food (the other half was in Turkish) I have a few problems. The waitor was really nice and while he only spoke Italian we were able to figure most everything out. I think I enjoyed the food a little more than Alex did but we both walked out full and satisfied! Stayed tuned for our last day in Naples and our three day trip to Roma! Friday after the wedding was spent showing my parents around some other areas of Florence, purchasing train tickets with my brother and his girlfriend for our upcoming trip to Positano. Saturday morning we woke up early and caught our early train to Naples. From Naples (heaps of trash abound) we caught the worst train ever, the Circumvesuviana, to Sorrento). 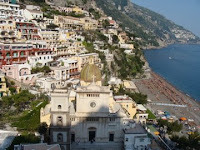 Once in Sorrento our plan was to take a SITA bus to Positano but the ticket window was close. Soon after we met an Australian couple on an 8 week tour of Europe who offered to split a 60 euro cab with us to Positano. The cab took about a quarter of the time, and while it was pricey, it was just so much more comfortable. We were dropped off at our teeny, tiny little alley way of a street that dropped straight down by way of hundreds of steps. I was surprised the cab driver didn’t pass it up it was so unassuming. I still have no idea how we got all of our 5 VERY heavy bags down those stairs. While is Positano we really were just looking forward to unwinding after our very hectic week in Florence. Days were spent eating lots of pasta (like spaghetti con vongole) and the best pastries we had encountered thus far on the trip. We also spent large quantities of time laying on the beach, swimming, window shopping, hiking, taking WAY too many pictures of the beautiful town and people watching. One of our favorite activities was to take a late afternoon passegiatta down to the beach, eat cannoli Siciliana, and chat amongst ourselves about passerbys. So entertaining for some reason! Oh, and for the first time we participated in siesta, which we dubbed “Napsitano” (we’re dorks)! My brother and his girlfriend were staying in nearby Sorrento for the first three days we were there. So they met us in Positano one evening, we showed off our apartment, watched “Superbad” (of course), and enjoyed a great meal away from the touristy beach areas. The next day they set off to Roma! We also partook in a lot of day trips outside of Pos during our week. Venturing out to Amalfi and visiting the amazing cathedral there, exploring quiet and peaceful, nearby Atrani, and finally making our way to the bustling city of Sorrento that had great shopping and the best gelateria I’ve ever been a part of. First off, when you walk in you can’t help but notice at least the 6 different nutella flavors…..plus many other mouth watering combos. Then you take notice to the thousands of pictures posted all over the walls and ceilings of the many celebs that have enjoyed gelati there….including the Pope. The place rocked! 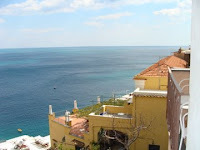 We left Positano the following Saturday after exactly a week. On the cab ride to Sorrento I tried to soak up as much of the scenery as possible as I don’t know when I’ll see it again! On the way to Naples we stopped off in Pompei to enjoy the ruins. We’re both really glad we stopped as it’s just something you need to see when you’re in the area. Although, it was quite hot and very dusty while we were there…and we missed the memo stating that Pompei is apparently the size of Rhode Island. It was huge….and after awhile we started to see a lot of the same. But all in all, very interesting and something that we’ll probably never seen again! A few hours later we made it to crazy Napoli…..stay tuned! I woke up around 8ish on Thursday (and surprisingly had the best night’s sleep I had had since being in Italy). I made my way over to my parent’s, brother’s and his girlfriend’s apartment on Borgo dei Greci (a few blocks away from Palazzo Vecchio) and got myself ready. We started with the hair, which was a bit stressful for Jin (my bro’s girlfriend) because the flat iron had shorted out the night before while she was practicing on my hair. EEK. Good thing my mom packed the curling iron. Towards the end we were running short on time so my bro had to jump in and help as well. By then Alec and Rachel (amazing friends) had arrived to change into their dresses as well. The dress was put on, the silk orchid placed in my hair, blue garter that was my grandmother’s placed on my thigh, makeup was applied and we were set to go. I knew there would be somewhat of a reaction as I stepped outside of the apartment but was not prepared for how excited people got when they saw us walking towards the Piazza. We were getting standing ovations, people smiling and shouting, “Auguri, Auguri!” It was great, the emotions started pouring in about then and I started tearing up because of the heartfelt responses complete strangers were having towards me. Soon after we all met up with the other group (the groom group:-) Alex looked so handsome in his CK pin strip suit! Oh yeah, I forgot to mention how beautiful my bouquet was that was delivered by GianLuca (the florist) a few hours prior to the apartment we were getting ready in. 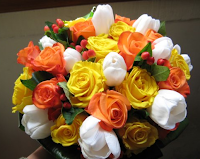 I wanted all Tuscan colors, it included white tulips, orange and yellow roses, and orange-red berries. Alex’s boutnier was an orange rose with the berries included. Helga met us there where I handed over the rings and our witness’s passports (my good friend Shauna and brother Ryan acted as witnesses). The photographer, Paolo, was there already as well right when we showed up and immediately started snapping away and photo directing. It was so crazy having so many pictures taken of us, neither one of us are used to being the center of attention….but we have to admit that we felt like rockstars! We entered Palazzo Vecchio and headed towards the Sala Rossa (Red Hall) where we were to be married. Kearney, my friend and coworker, was the videographer and did a great job of capturing everything on film for us! There was another wedding ahead of us so we sort of milled around for about 15 minutes until it was through. We took pictures with the official that married us and it was time to go outside and go on a “photo tour” with Paolo. We were told that he would take about 200 pictures, print the best 50, and send us the rest on a disk. About 3/4 of the way through he showed us both that he had taken over 600 already. He was workin’ hard! People continued to cheer and clap for us and we took pictures in Piazza di Signoria, The Loggia dei Lanzi in the same piazza, the Boat Club on the banks of the Arno, and then finally on the Ponte Vecchio. About halfway through my feet started to resent me because of the heels I made them wear….anything for beauty right…..I guess!?!?! After the photo tour we walked over to SACI to have a small reunion with the professors and staff from the school that had brought us to Florence in the first place. It was so great being back and seeing some of the familiar faces. They were all super excited for us and took a lot of pictures of us for their newsletter and website. Towards the end of our reunion at SACI I started getting a little grumpy, mostly because my feet were hurting sooo bad. So we decided to just hightail it back to our apartment that was very closeby at this point. Kearney got the footage of Alex carrying me over the threshold, which was a challenge because our “hobbit hole” of a door was about 4 feet tall and maybe 2 feet wide. It was a trip. We changed, ate lunch, and met friends at the Boboli Gardens for a perfect end to the afternoon. It was still so amazingly sunny outside and just beautiful. Afterwards we went back to the apartment to get ready for the wedding dinner at La Terrazza del Principe near Piazzale Michelangelo. The restaurant was so beautiful. 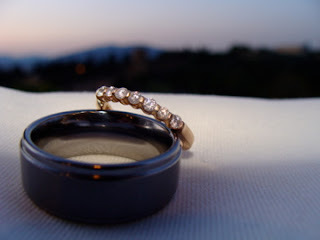 It had a backyard like setting with a terrace that had a great view of the Boboli Gardens where we were earlier and the majestic Tuscan hills. They had champagne and aperitivos for us to snack on while all the guests arrived. We moved inside for dinner as some people were cold and enjoyed a very delicious 5 course Sicilian meal (we were told by our cab driver that the food was typical Sicilian cuisine). 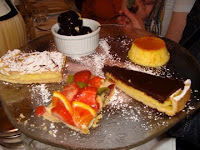 Everything tasted so fresh and great, I love good Italian food :-) Alex and I even had an Italian wedding torte with kiwi and strawberries to cut and feed eachother. Afterwards we bid our guests farewell as we filled each grouping into a separate cab. We had such a wonderful wedding day, it was picture perfect, and we couldn’t have asked for anything more! After Monday (the 21st) we had two more full days before the Big Day :-) These days were spent dodging rain showers and downpours, showing family and friends all over Florence, eating lots of gelato, window shopping, and shreaking with glee! Some of the highlights include showing our parents and friends Piazzale Michelangelo (some of the best views of the city) and San Miniato. 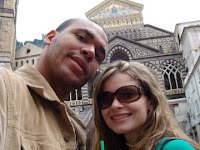 Neither Alex nor I had ever been to this amazing Florentine church before, and I could kick myself for it. It has topped the list of my favorite churches in all of Italy. The gardens and cemetery surrounding the church were all so beautiful to begin with….and then once you enter the dark yet peaceful cathedral (which is free btw) you can’t help but be awestruck. 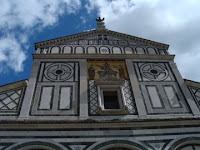 If I’m not mistaken the church was resurrected in 1081 A.D. and all other churches in Florence were modeled after it. Soon after we had the second Bufa reunion since we left Florence in Fall 2004 with Alec (my “Best Woman”) and Rachel! To those not in the know let me explain the term “Bufa” real quick. 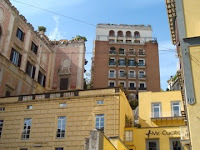 Alex and his other 6 rommates lived on Via Bufalini……thus was born the “Bufa” name! 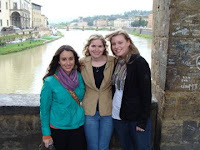 We all met on Ponte Vecchio in a squealing fashion. I was so excited about it and overwhelmed that I even shed a few tears. For lunch we enjoyed ourselves at Il Rifrullo, which was recommended by Erin from the “Olive Notes.” The appetizer we shared was fantastic! That night we enjoyed the meal of our lives. All families and guests met at Il Latini, a restaurant I’ve heard so much about ever since before my first trip to Italy, compliments of Rachel Ray and many others. We were able to find it thanks to mapquest and waited outside for maybe 15 minutes before being ushered inside. May I add that while we waited we were served HUGE wedges of pecorino cheese and great vino bianco (white wine). Right as we say down the food just started rolling out, hard and fast :-) It’s one of those places where you don’t even dare to open your mouth and refuse…..and menus?!?!? Who needs them??? First came huge “pornographic” (as my twin says) amounts of proscuitto. Then came pastas and soups. Alex and I both couldn’t stop talking about the penne con bolognese! It was like a dream! Then came the meat, I tried rabbit for the first time and couldn’t get over how moist and how much it was like….well….chicken! So many other things came before the delectable and lucious (mmmm lucious) desserts. There were so many alcoholic beverages crowding the tables, liquors, house wines, sweet wines, limoncello, you name it it was there. I don’t think anyone will forget the epic meal that was Il Latini, I highly HIGHLY recommend the place! Wednesday was spent like many of the previous days. Sightseeing with friends and family. We revisited the Medici Chapel in San Lorenzo and oooed and awwed over some more works of MIchelangelo’s. We also made a visit to Mercato Centrale and did some shopping for our apartment. I just love walking around there and speaking with the shop keepers. It’s so fun and everything is so unbelievable fresh! 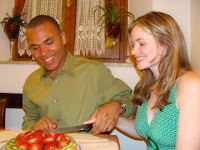 My good friend and old roommate Shauna and her friend A.J. arrived in Florence Wednesday afternoon as well. We met them in a piazza and bee lined it to Sad Gelato Man on Via Faenza. While there we took some unforgetable pictures and ate some unforgetable gelato. 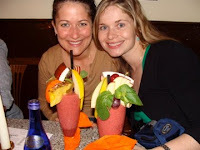 Then it was off to Art Bar to drink and eat fruity, smoothie like alcoholic beverages…..we spent our last night as single people perfectly! So here I am, it’s 6 am (thanks jet lag) and I have this burning need to start blogging about our wonderful trip/wedding/honeymoon to Italy. A country I’ve longed to run back to ever since we left in Fall 2004. So yes, it was finally our time to go back, we were so beyond excited (or at least I was). The flights over were fine. I can’t remember being more uncomfortable on an international flight though, just having the want to sleep but not being able to because of the “sitting position.” We flew Air France and had our connecting flight to Florence in Paris. From now on we will try to avoid the Charles De Gaulle Airport like the plague. The place is just too huge and disorganized. You shouldn’t have to sprint to your gate when you have an hour and fifteen minute layover. It was kind of ridiculous! 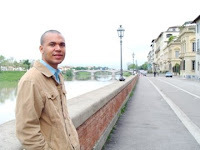 We spoke to the nicest Florentine on the way to Florence from Paris named Aldo. He was a professor who spoke five languages and was so flattered to hear that we were traveling all that way to get married in his hometown. 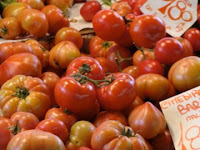 We discussed all regions of Italy, the food of Florence, and much more. We exchanged information and he urged us to send us pictures of our wedding once we got back. We washed our faces, changed clothes, and headed out into the city we had missed so much. It was weird for the first day and a half I have to admit. I didn’t remember that the streets were so so narrow, and that cars came inches from people while passing by, and all of the graffiti, there just seemed to be more. Alex thinks we felt like this because when we were living there before with our study abroad program we held Florence in such a high regard and we had all this “fluff” in our lives…..hard to explain, I’m just throwing it out there. 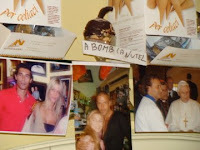 My brother and his girlfriend had dinner with us that night at a great Trattoria on Via di Neri. We feasted on wine, Ribollita, Papa al Pomodoro, pizzas, fish, and of course unsalted Tuscan bread with olive oil and balsamic vinegar (Alex’s Italian version of chips and salsa). The meal was so great and we were glad we enjoyed such a feast on our very first night. Afterwards we walked to Vivoli (probably Florence’s most famous gelateria) and enjoyed some authentic flavors. Soon after my parents arrived at their apartment and we set back to our apartment on via chiara for a noisy night’s sleep! OY….living so close to the market for a week was tough, a lot of street noise. We’re back from Italia. It was a little sad leaving bc we don’t know when we’ll be back. We had such a wonderful trip, wedding, and honeymoon! I wrote everyday in my red journal that I wrote in the first time I lived in Italy. And I’ll be sure to refer to it when I’m posting here. a quick post mid trip! i’ve been recording each day in my special red journal and promise to have detailed posts once we get back. we just left Positano, we were there for a week and i fell in love! and think alex did a bit too. the weather couldn’t have been more perfect, our apartment was lovely with two terraces that boasted the best view in the small city. we arrived in napoli mid day and are now relaxing in the hotel vesuvio on the bay! we haven’t really come up for air since we’ve been gone, always going going going! the wedding was lovely, we couldn’t have asked for better weather in florence and everything went so perfectly!!! !